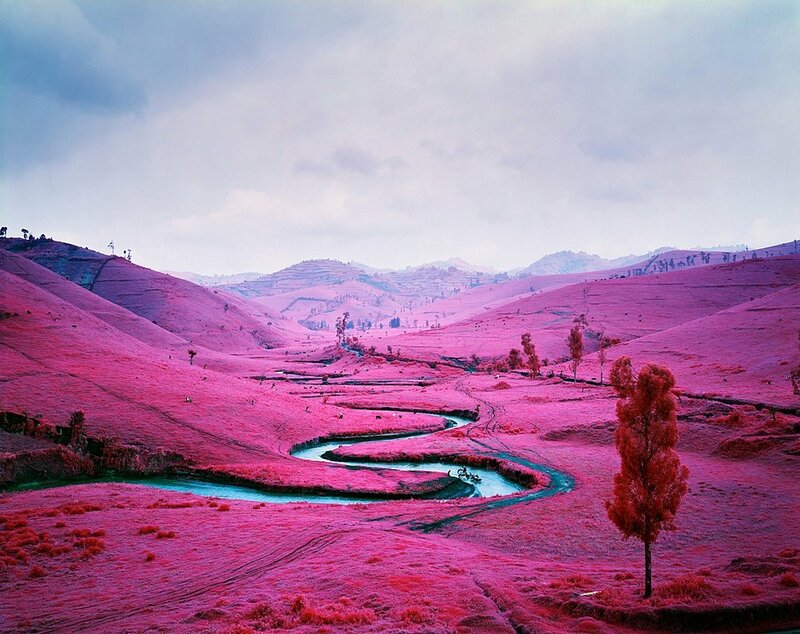 Richard Mosse’s color infrared photographs of the Democratic Republic of the Congo have traveled the world. Their impact is undeniable. Their red-magenta dye have made us look at this never-ending war again, and again, and again. Should we dare say with a different look, as many critics have? What is the “normal” way of looking at the consequences of a war? If we go about it from a (too) purely aesthetic perspective, there’s little doubt his approach is not only valid but enlightening, for the colors open the dynamics of the content at work; we stare at the magnitude of the landscapes and there’s a sense of encountering something new, something truthful. We stare at the beautiful man made landscapes and the not so contaminated ones, but then comes death with all its chocking nature and then we enter, again, into the surreal realm of Sontag’s “inauthentic beauty”. 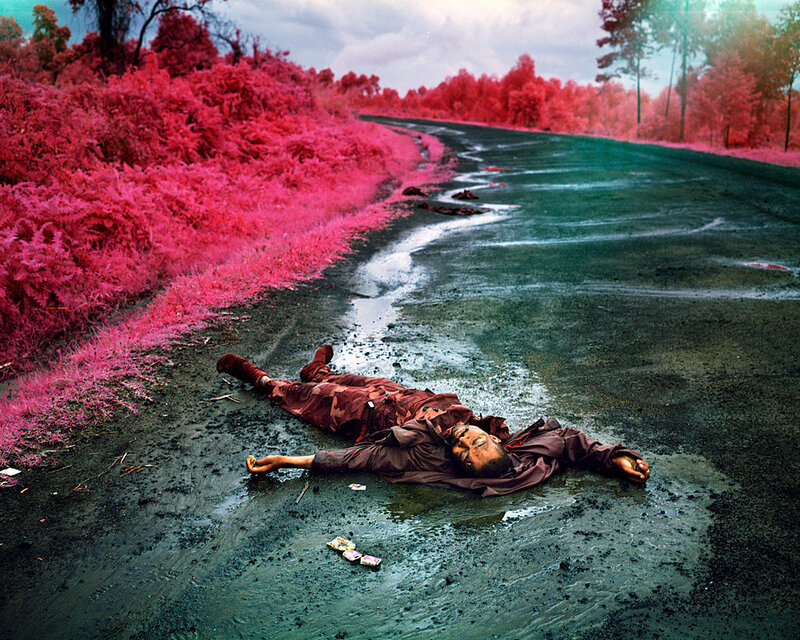 There’s this image, in the middle of Mosse’s project, that I can’t quite forget and I can’t quite forgive. But who or what am I not forgiving or forgetting? Definitely not the person who’s absent blood is being portrayed here, for here there is no identity, no soul; this man left in the ground is but an object, can’t see it any other way. I find myself going back to the same doubts I had 10 years ago when I was a student and, in classes, I kept being showed this supposedly great images that captured some “remarkable moments in history”: I stared at most of them and didn’t understand the ethics that went along. Today I realize that is the bridge that triggers my visceral reaction to photojournalism: the ethics at work (or lack thereof). In the photographic debate there’s usually talk about ethics, I’m not denying that, but, still, it tends to be cut short by some statement about the necessity to show, to make public, to denounce it… you name it. And still, I can’t quite understand the truth “behind” this image. Let me explain: I struggle with the sort of imagery that, being documentary in essence, aims for an aesthetic experience, and I realize that might be the intention behind this particular photograph (as so many until now) to provoke a sort of inner struggle that makes a claim about human condition – to love and to hate, to feel desire and repulse. But, when talking about an aesthetic experience, I could care less about intentions. Meaning: intentions are nowhere to be found in the artwork. As I see it, the artist is the work, there’s no artist “behind” the work, as there is no intentions “behind” the work. It’s maybe too cruel, but I feel that if we get to that sort of discussion is precisely because something is lacking in the work, in its truthfulness, its soul, its originality, its “aperture”. I keep thinking, and at the same time I feel naïve for putting myself in this position, that there’s no reason for the image of this dead men to enter to circuit of photographic imagery. I believe there are events, moments in time, intimacies, so many things that should be kept far away from this kitschy feel. As if, once aestheticized, they became saturated with intention, effort, fiction, make-believe.